AUBURN HILLS – In a span of 12 hours, Ed Stefanski erased months of hand-wringing over how the Pistons would confront the prospects of free agency for two of their rotation staples. In the process of shedding Reggie Bullock and Stanley Johnson in separate trades, Stefanski at once validated his first draft night’s yield of Bruce Brown and Khyri Thomas, created the latitude to become a more active player in summer free agency and added two intriguing international 21-year-olds with the profiles that mesh ideally with Dwane Casey’s offensive vision. Even if it was going to be difficult to retain Bullock in free agency – it was, with the likelihood that he’ll land a multiyear deal in the range of $10 million annually, a very tough pull for the Pistons this July when they’ll start off over the salary cap – and potentially problematic to keep Johnson, these still aren’t trades Stefanski likely executes if he hadn’t seen enough from his rookies, Brown and Thomas. Luke Kennard’s role almost certainly expands with Bullock traded. Whether Casey plugs him or Langston Galloway into Bullock’s lineup spot, Kennard is in line to see his 20 minutes a night average head north. That’s driven by pure necessity but at least as critically by the need to see how Kennard responds to the added responsibility that comes with more minutes. That includes the challenge of tougher defensive matchups, especially if he’s starting. We’re almost certain to see more of Thomas now, too, and he was on the cusp of more playing time even if Bullock and Johnson hadn’t been traded. Even in limited time, Thomas has the Pistons convinced he’ll be a net plus on the defensive end – for his tenacity as much as his physical gifts – and nearly as certain of his offense. That stroke is ripped from the pages of a Wooden-Iba textbook. Brown was thrown into the deep end of the pool and Thomas is about to be but – as with the case of all those kids who grew up fast in Toronto under Casey – the payoff should be evident for the Pistons next season. The fact Stefanski didn’t wait around to see how the market played out for his two pending free agents tells you he has full faith in his first two Pistons draft picks flowering similarly. No, the Pistons aren’t going to be chasing Kevin Durant, Kawhi Leonard or Kyrie Irving this summer. But they’ve put themselves in position to do more than sit on their hands and wait for the third and fourth waves of free agency to yield a picked-over bargain. Oh, they’ll be interested in finding one of those, for sure, just as they got great value in signing Zaza Pachulia to a veteran minimum last July. The other free agency worth watching for the Pistons is Ish Smith’s. He’s among the most reliable backup point guards in the NBA, someone who proved a capable starter when injuries wrecked Reggie Jackson’s last two seasons. The moves that brought back Svi Mykhailiuk and Thon Maker filled two roster needs for next season with low-cost rookie deals, giving the Pistons the space to retain Smith or someone of similar quality for the critical role of backup point guard. They’ll have their first-round draft pick, too, as it stands in addition to a trade exception created by the Bullock deal. And with Brown, Thomas, Mykhailiuk and Kennard all playing on rookie deals in 2020-21, too, the cap possibilities expand in the 2020 off-season. As much as Casey talks about the conversion to his offensive system with its heavy emphasis on spacing and prioritizing shots at the rim and the most advantageous 3-pointers being a process, the 53-game sample size loudly suggested the roster needed tweaking to put 3-point shooters at more spots. 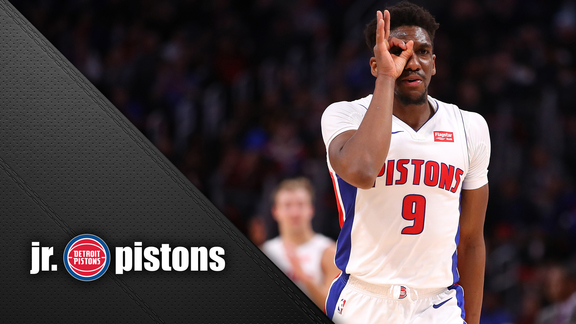 The Pistons rank 28th in 3-point shooting at 33.5 percent. No one saw that coming for a team that a season ago ranked fifth at 37.3. If the Pistons had matched that figure this season, they’d be scoring 110 points a game instead of 106. Instead of a scoring differential of minus-1.9, they’d be at plus-2.1. The two teams with a differential closest to that are Houston (plus-1.8) and San Antonio (plus-2.3). The Rockets are 31-22, the Spurs 32-23. How much the Pistons gave up on defense in trading Bullock and Johnson plays into this, as well, of course. But coaches are of the mind that, given a modicum of continuity, they can cobble together good team defenses. Shooting requires good shooters. Casey’s offense has manufactured as many open 3-pointers as elite offensive teams and gotten little to show for it. Adding Mykhailiuk and Maker inches Casey that much closer to being able to put four plus shooters – and five when Maker plays – on the court at any given time. Mykhailiuk, at 6-foot-8 with a game not unlike Kennard’s for his ability to shoot and put the ball on the floor for more than straight-line drives, could wind up playing any of three positions down the road. In today’s NBA, he’d probably be challenged more guarding threes than fours. Maker, a 7-footer with a 7-foot-3 wing span and a 9-foot-2½ standing reach, is more than a project – though he surely has intriguing potential. He’s played real playoff minutes and produced, averaging 5.7 points, 3.5 rebounds and 1.8 blocked shots in 20 minutes a game over 12 postseason appearances at a tender age. He’s comfortable on the perimeter offensively – an effective corner 3-point shooter, an indication he’ll grow into a consistent perimeter shooter – and a rim-protecting presence on defense. And the Pistons get two months this season plus all of next to determine exactly what they have. But you can see the possibilities of a bench next season with Maker giving Casey a second unit that presents a wholly different identity than the starters. Some combination of Mykhailiuk, Thomas and Brown – perhaps all three, if Casey follows through on his vision of Brown as a point guard – could join him, plus a key piece or two Stefanski mines with the cap flexibility created by his deadline deals. The alternative was holding with a status quo that 53 games suggests wasn’t the solution – and likely not being able to afford even that much once suitors started lining up for Bullock and Johnson. The effects on this season remain to be seen, but there were no guarantees standing pat would produce something more than the ninth-place status achieved to date. The effects on next season can only be positive.